The Supreme Court decided only 75 cases in the recently completed October 1998 term. This is less than half the number it decided in an average term during the 1980s, and there has been a one-third reduction in the size of the docket just during the 1990s. However, the 75 decisions included many major rulings, especially in the areas of federalism, criminal procedure, due process and civil rights statutes. When constitutional historians look back at the Rehnquist court, they are sure to say that its most dramatic changes in constitutional law were in the area of federalism. In prior terms, the Rehnquist court has narrowed the scope of Congress' powers under the commerce clause and section five of the Fourteenth Amendment, used the Tenth Amendment to invalidate federal laws commanding state legislative and regulatory actions, and expanded the scope of states' Eleventh Amendment immunity to suits in federal court. In three decisions handed down on the final day of the October 1998 term, the court greatly enhanced the protection state governments have against being sued without their consent. All three cases were decided by identical 5-4 margins, with the majorities comprised of Chief Justice William H. Rehnquist and Justices Sandra Day O'Connor, Antonin Scalia, Anthony M. Kennedy and Clarence Thomas. Alden v. Maine, No. 98-436 (June 23, 1999), involved a group of probation officers who sued the state of Maine claiming that they were owed overtime pay under the federal Fair Labor Standards Act. 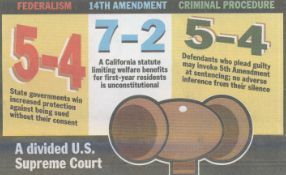 They initially sued in federal district court, but the suit was dismissed based on the Eleventh Amendment. The probation officers then filed their claims in state court. The Maine Supreme Judicial Court held that the state had sovereign immunity and could not be sued in state courts without its consent. Andrew Guilford and James Seff are more alike than different: partners in large law firms, political moderates, strong supporters of the State Bar, thoughtful about effecting change. Each is a photographer. Both love history, with a particular fondness for Winston Churchill. They even sound alike as they discuss the future of the bar and the legal profession, the importance of access to justice, and the protection of attorneys' core values. Not surprisingly, they also are good friends. Later this month, their colleagues on the bar's board of governors will choose one to lead the organization as its 74th president next year. 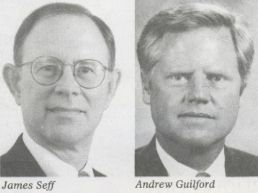 Guilford and Seff are wrapping up three contentious years for the bar that began just after a plebis-cite, which called for the dismantling of the bar, failed on a membership vote. The board erupted the first year of their term when five public appoin-tees clashed repeatedly with former President Tom Stolpman over issues such as the nearly $1 million contract the bar entered into with its Sacramento lobbyist. Then came Gov. Pete Wilson's veto of the fee bill, followed by the near extinction of the organization. With the prospect of renewed funding in 2000, both candidates see an opportunity to rebuild the bar, repair relations with Sacramento and reconnect with the state's attorneys. "This is a great opportunity to re-engineer the bar from the bottom up," says Seff, 58, a partner with Pillsbury Madison & Sutro in San Francisco. Action on a recommendation to permit attorneys to become partners with non-lawyers should be delayed because the proposal raises more questions than answers, the State Bar board of governors decided.